From the "Culinary DNA" article in the March 2018 issue. 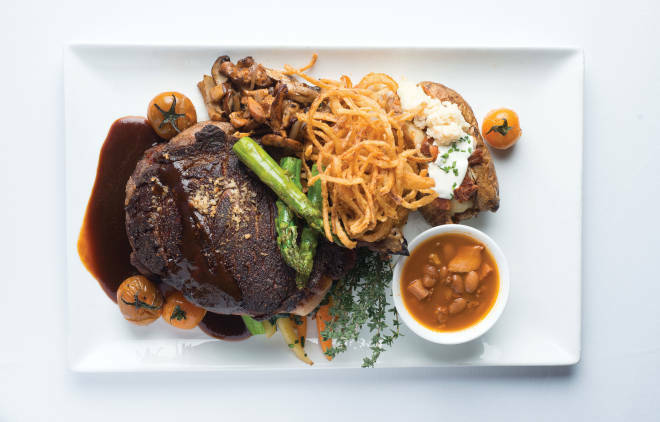 This hearty steak has been on the Coyote menu from the beginning, and you can still enjoy it in the restaurant today. Fortunately it’s easier for a home cook to find USDA Prime beef today than it was 30 years ago. Let steaks sit at room temperature for about 1 hour. Soak onions in milk in a large bowl for 1 hour. In a medium bowl, mix together the flour, chile, cornstarch, salt, cumin, sugar, and paprika. Drain onions, then dredge in flour mixture. Heat at least 4 inches of oil in a large, heavy saucepan to 360º. Add onions in batches and cook until golden brown, about 45 seconds. Transfer with tongs or a large slotted spoon to paper towels. Transfer onion rings, in a thin layer, to a baking sheet and keep warm in the oven. Season steaks generously with salt and pepper. Heat two large cast-iron skillets over medium-high for several minutes. Add steaks. Cook to desired doneness, about 7 minutes per side for medium rare, pouring off excess fat before turning. Transfer to plates, scatter with onion rings, and serve right away.